Help to promote your business by getting your details printed onto one of our popular Company Fridge Magnets. 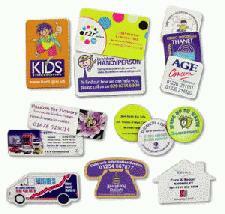 These Company Fridge Magnets can be supplied in a huge range of sizes, shapes and textures. Just decide on what would work best for your company and give our friendly team a call. If you cannot decide which Company Fridge Magnet would be best suited to your company needs, the team will be more than happy to chat through the options with you. So make sure you get your name noticed by giving out Company Fridge Magnets printed with your name and phone number to all your customers, friends and colleagues. Dont delay call today. To find out more about our Company Fridge Magnets click here and fill in the contact form and we'll get straight back to you. Other promotional and personalised items besides our Company Fridge Magnets click here.